Page 2, Version 5.2, ©2002-2005 by Dale Cotton, all rights reserved. An important pre-requisite is access to a good arts and crafts store both for the initial tools and for the consumables you'll need for each framing session, such as mat board, backmat, and frames. Much better: board-mounted mat cutter - more expensive but is far more likely to give you crisp square corners, as well as having presets to expedite cutting multiple mats to the same measurements (see Adam Nixon's note on page 7). I buy sheets of mat board from the local art-and-craft store. I spent quite a bit of money buying the two critical mat-cutting tools, both shown in the Tools photo above. The Logan 2000 mat cutter looks like a small hand plane, but essentially holds a razor at a slant. 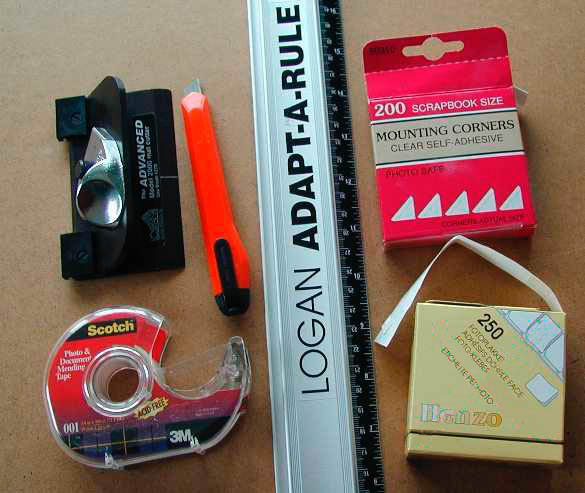 The Adapt-a-Rule is a metal ruler with a track along one edge in which the mat cutter slides. I'm sure there are other brands, just avoid anything flimsy. While at the arts-and-crafts store you may notice pre-cut overmats for sale. If you always crop your images to exactly 8" x 10" or 11" x 14", etc., then you can use pre-cut mats. In my experience, most artists dislike having aesthetic decisions made for them. Note: For the sake of clarity let's work through a specific example from here on. Let's presume I have a print on 13" x 19" (Super B) paper to mount in an 18" x 24" frame. If you do 8" x 10" or 11" x 14" or whatever you simply change the numbers proportionately. Providing three different sets of numbers at every stage will be too confusing to read, let alone to write. Also, many calculations depend on the image size as well as the paper size, and, for me at least, image size varies with each image.